Possible Asteroid Affecting Younger Dryas in Controversy. A team of researchers led by an archaeologist from Aiken has found widespread evidence that a large object from outer space, such as a comet or an asteroid, hit the Earth about 12,800 years ago. That collision might explain why the climate in the Northern Hemisphere, which had been warming up in the wake of an ice age, abruptly returned to near glacial conditions during a period known as the Younger Dryas. In addition, the discoveries by Dr. Chris Moore and his colleagues could provide support for some scientists’ claims that a large number of Paleo-Indians from the Clovis culture also died off around that time because of a comet strike. Scientists haven’t identified a crater yet that can be traced back to the onset of Younger Dryas, but Moore still believes one might exist. There also are explanations for why an extraterrestrial object wouldn’t leave behind a huge hole. “It might have hit an ice sheet up where Canada is today,” Moore said. “In some places, the ice was 2 miles thick. Impact studies have shown that ice absorbs energy, so there wouldn’t have been any crater. It also might have come in at a low angle, hit the Earth’s atmosphere and exploded, sending out shock waves” that caused more damage than the small pieces that fell to the ground. Those Younger Dryas impact theories have been around for years. As far as I'm aware, they've all been disproven. A 2013 study found a spike in platinum in Greenland ice. The authors of that study conclude that such a small impact of an iron meteorite is “unlikely to result in an airburst or trigger wide wildfires proposed by the YDB impact hypothesis." Finally, researchers have criticized the conclusions of various studies for incorrect age-dating of the sediments, contamination by modern carbon, inconsistent hypothesis that made it difficult to predict the type and size of bolide, lack of proper identification of lonsdaleite, confusing an extraterrestrial impact with other causes such as fire, and for inconsistent use of the carbon spherule "proxy".Naturally occurring lonsdaleite has also been identified in non-bolide diamond placer deposits in the Sakha Republic. Only way they'll dispel the theories is to find the impact crater, if it did indeed make impact. Just out of curiosity, what are the other theories on the YD dip? The one I'm most familiar with is the traditional explanation. I.e. outburst flood from the melting Laurentide ice sheet shutting down the N. Atlantic. There aren't any other theories out there with any kind of solid evidence (including the impact hypothesis). So, I suppose the question is what caused the melting? Ice ages come and go, but what trips the switch, if it isn't something like an impact ? Sounds like a dumb question, but I don't think I've ever had it explained in a manner that rounds out the process in my mind. It's definitely not random celestial impacts that have driven the glacial/interglacial cycle since the Pleistocene. The cycle has been way too harmonic and predictable. You just wouldn't get that with random chance (which is what impacts are). The glacial/interglacial cycle over the last 2+ million years goes back to things like orbital eccentricity, axial tilt, and precession. So, I wonder why that isn't brought into the discussion with climate change? It may not be the main driver for shorter term swings, but I find so much single mindedness today. These events occur very frequently under glacial boundary conditions, and in fact, they are usually preceded by prolonged periods of global cooling, not warming/melting. Well, I think the meltwater surge theory also leaves much to be desired. The more recent proxy aggregates suggest a globally synchronous younger Dryas, which was most intense in the NATL area, but was preceded by instabilities in the tropics by a few decades...specifically an abrupt cooling in the WPAC and Indian Ocean, down to temperatures as cold or colder than those observed during glacial maximum. This is revealed through various proxies for ITCZ behavior/seasonality, which suggests it was pinned right at the equator when the younger Dryas began. Maybe there was a meltwater surge, but the problem here is that WPAC/IO cooling corresponds strongly to NATL cooling, with very few exceptions. So you would expect ice sheet growth across the NATL domain, not warming/melting, right? 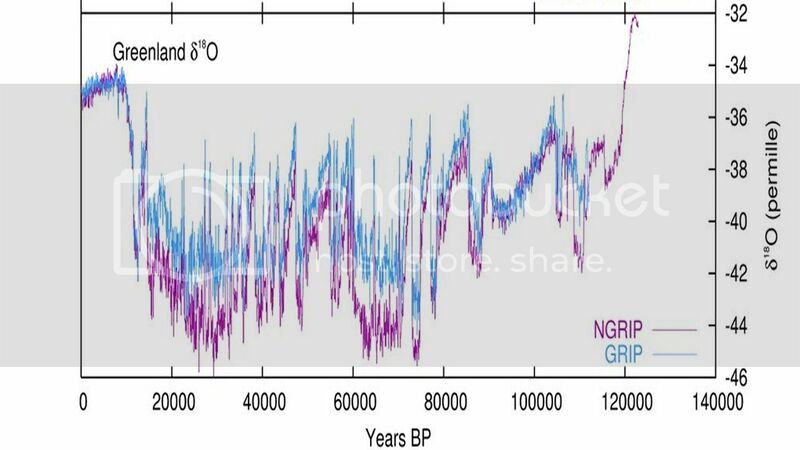 I believe the inception of the Pleistocene Ice Age proves that mere shift in ocean/atmosphere circulation can alter the planetary radiative budget enough to force dramatic climate change, whether it be through changes in tropical cloud cover, convection, heat and moisture transport, or what have you. The ENSO's effect on global climate is an example of this same basic process, just on a much higher frequency. My hunch is that the climate system is simply more unstable/variable than we give it credit for, and that the younger Dryas was simply one of many D/O type climate oscillations, which are common when the system is transitioning between two quasi-stable modes of operation. The system may tend to "jump" back and forth between said states during such transitions, almost like a sputtering engine.